Looking for square parts for your chain link fence? SquareFittings.com understands square chain link fence fittings are difficult to find, and we are here as a one-stop shop for your unique chain link fence. Our square bands, barb arms, clamps, latches and post caps are designed to fit square posts and pickets. Our square hinges, floor flanges, drop forks, line tops, collars and more are made from high quality materials that are built to last and withstand frequent use as well as withstand harsh weather conditions. Need to shop by gauge, post size, picket size, or metal type? We make it easy to find the right square chain link fitting. We stock fittings for all types of squre steel tubing, in a variety of sizes. 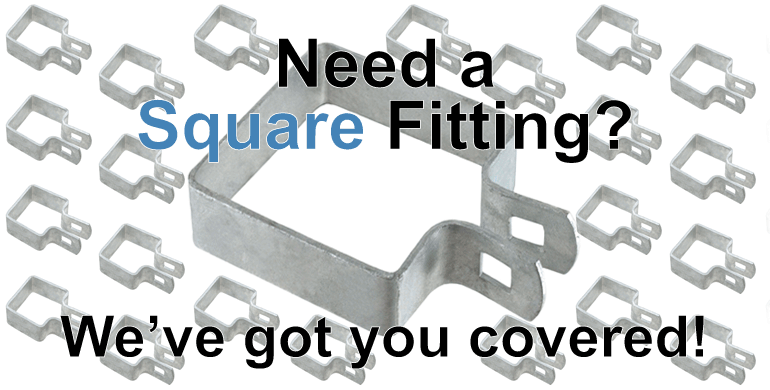 Questions about our square fence fittings, interested in purchase orders, or need a quote? Call us at 1-800-878-7829 or email us at Sales@SquareFittings.com to speak with a professional sales representative today!